[Netherlands] [Custom/10.98] Animera OT V5.0 Big update! | New vocations | New pets and more! We have official moved to our new server, so we expect a more stable gameplay and a better overall performance. There are still few stuff that causes crashes but will be solved very soon. Also the issue with client crashes is solved, you can download the new client at the new website! Santa is able to give each account every 24 hours a free item! This may be skilling items, gems, ammo, rings, money or other stuff. The Santa will also give Santa hat to the lucky one!! Regenerates 20 mana every 2 seconds. EVENT ONLY! You can also drop your Christmas present bag for 5k Exp each. 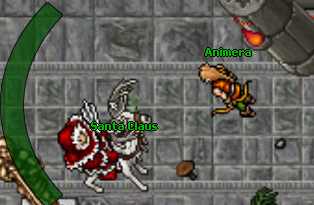 Santa will leave Animera at 1 January. - Pets cannot be used in PVP anymore, but have received a 50% increase in power. - All quest chests will now give also 2 skill points each. - Added new boss mechanics. - Attack speed and magic resistance is lowered in cost slightly. - HP and Mana cost is vocation based and increases by every purchase. - Few other small fixes. Anyone who needs skilling weapons and pizza, message me ingame! if i wasnt busy on another game i would try this out once again.Hopefully when i get bored your server is still around. Hopefully all of you had a wonderful Christmas and a great year overall! 2018 was an amazing year for Animera, our community has grown with an great amount of new members. This growth won't stop in 2019.. We have big plans for 2019 to continue improve thanks to all of you for being here and being part of our community. - Solo Mode added to the story mode. You can activate solo mode after clearing story mode I. All bosses will be 25% weaker and will give 25% less exp/money. The settings cannot be changed anymore. - Double skill for 30 seconds. - Avoiding a move of the legends will give a nice random skill burst (that suits to your vocation). - Normal mode bosses has a greatly increased loot! - Skilling weapons improved in speed and server performance. - Legendary upgrades works now also on monk weapons, and will improve wands in damage too. The stat increase also affect spells and ofcourse your average melee/distance. - Earth worms/Pit worms/Yeti/Genocide Machine/Plague slightly nerfed. - Monk melee (again) slightly nerfed. - Exp room is opened again. - More visual hints added to noob places. - Teleport to Isle of legends below temple added. - World chat / Help Channel automaticly opens onlogin. - More spells added to spell scrolls. - Battle mages are now able to learn Ultimate Healing and Mana shield too. - HP/Mana cost increase per purchase is slightly reduced. - New quests added that increases your max health and mana. - Shielding requirement for avoid chance is reduced for most vocations. - Creatures average melee damage reduced. - Pets can get stronger by every level up (cap: level 125). You can now say !pet stats to see it's level or by looking at them. - Damage of legendary vocations reworked. - Spawntime of bosses increased. Man i lag so bad on your server it killed any fun. Like its a small lag every 3-4steps that really makes it a pain after a long playtime. I would have probably spend more time if it werent for this problem. I mean i play brasil,poland, server from canada and have 0problem usually. I am sorry to hear that.. do you also experienced lag in our earlier versions? Because since then we moved to a bigger server.. Meanwhile we also have added new systems/maps etc. but when i check the resource usage it's low, it's higher with a longer uptime.. but according to znote there is barely improvements possible with my current package.. and as far as i know him(years of experience with hosting/his part of developing tfs etc). i would believe that blindly..
As far as i know europe servers doesn't have a good coverage in far away countries.. But i guess that's everywhere.. If you know any good gaming proxies, feel free to share with me. - On our next server save we will start with new gaming proxies (Location: Canada), we would like to have people who'se willing to test if there is any improvement on gaming performance. If so we will expand it. - Swimming animation bug fixed. - Paladins can spend skill points in magic level again. - You do not have to retarget anymore after calling your pet. - New client coming soon. - Few map bugs fixed. - All scripts that could potential cause crashes is fixed. We expect now no crashes anymore. But we have to see that first ofcourse. There is already barely crashes these days. So now even less for sure! - !target command is improved in accuracy and reliability . - Pets cannot harm creatures anymore if the owner is unreachable. - Summons/Pets will now keep a bigger distance and will be easier to steer..
- Story mode boss doors will have a 15 minute cooldown on respawning them. - Hunting at the EXP rooms will now consume soul, if your soul reaches 0 you get kicked from the room. Damage from the creatures there is also reduced! - On start you will have 100 soul, this increases by 100 for every promotion you have. Max 300. - Reduced paralyze duration of blizzard spell. - some small bug fixes/map bugs..
- More creatures drop now soul stone, giving you a slight soul refill. - Anifried will teleport players to all important places in town below level 75 instead of 40. - Wasps from Sunrise city raid do not have the swarm ability anymore. - !attackspeed command moved to new command !stats. - !statsreset command added to reset best hit / average dps score.